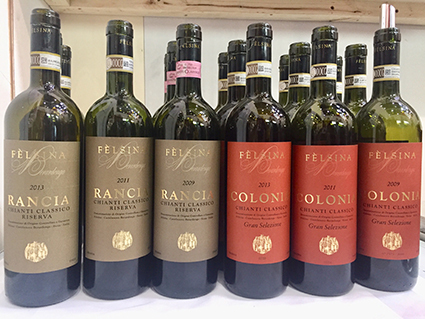 It was a great pleasure to be able to moderate a tasting of some sensational Chianti from Fèlsina. In the company of the CEO Giovanni Poggiali, and my friend Giuseppe Lauria from the magazine Weinwisser. The tasting was one of the many highlights of the DeSA (Deutsche Sommelier Association) stand at the busier-than-ever Prowein show. Organised by the astonishing and wonderful whirlwind of charisma that is Maria Sofia Dare Biancolin. Fèlsina is the producer of the original Berardenga, one of the wines that first got me into the subject, back when I worked in Oddbins in the 1980s. They are celebrated for being one of, if not the – pioneers of using 100% Sangiovese in their Chianti wines – which is still not common today, and certainly was positively avant-garde when they started in 1966 (at one point it was technically legally compulsory to use some white grapes in red Chianti. They make a range, not only of Chianti, but also some white and sparkling wines, but it is for their Chianti Classico DOCG that they are celebrated. Within this, they produce small parcel wines, headed by the single vineyard (which resembles the Masseto vineyard of Ornellaia in every way other than price!) of Colonia. We started with a three-vintage tasting of ‘Rancia’ which is a Chianti Classico Riserva DOCG, and then onto the same three years for Colonia, which falls under the new (for wines bottled/released from 2014 – so it can be applied to earlier vintages) DOCG of Chianti Classico Gran Selezione. Within Chianto Classico, the Riserva DOCG used to be the highest category, but it was open to abuse. It simply demanded that the wine be aged longer. And it is a truism that long aged mediocre wine does not become good wine, it just becomes old mediocre wine, and possibly the worse for that. Accordingly, some of the top producers pushed for a new category – Gran Selezione. These wines have to be made from 80% Sangiovese, achieve a higher level of alcohol (itself a measure of ripeness), and be aged for 30 months instead of 24 for Riserva. The grapes must come from the property’s own vineyards. Meeting Giovanni, you somehow feel that all this has passed him by a little. His top wine is far beyond even this – it is a single vineyard of pure Sangiovese, and aged for as long as the wine demands. If you like, it is a Super Gran Selezione Riserva Chiantio Classico DOCG. For Giovanni, I suspect, none of this is even vaguely approaching the relevance of the fact that it is Colonia. For me too. For a few decades, the producers of Bolgheri have cornered the adjective Super(-Tuscan) for often Bordeaux or Napa-alike wines with international appeal, style and quality. But the real super-ness of Tuscany comes from Chianti, where some great wine has been made for millennia. No-one can argue that Colonia is not one of those. I was delighted to discover that this rocky vineyard, enclosed by woods, although spotted as a great potential site a long time ago, was actually only successfully cleared (using dynamite and a lot of hard labour) as recently as twenty-five years ago. So, although these vines would qualify as ‘old’ by some measure, they are still young enough to suggest that even better is to come. Which would be truly remarkable. 20 months in French oak, 50% new. 30+ months in new French oak.